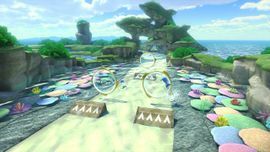 Dolphin Shoals is second race track in the Star Cup of Mario Kart 8 and Mario Kart 8 Deluxe. This course takes place on a beach with dolphins swimming around and an undersea cave with a large Unagi. The dolphins here appear as in Mario Kart Arcade GP DX. Multiple dolphin shaped hills can be seen in the background. The course starts in a lake. There is a left turn coming out of the lake and then leading back underwater with three ramps in the section. One on the left, one on the right, and one straight ahead. There are rings where the players jump over the ramps, where Dolphins also jump through. After that section, still underwater, there is a left turn leading the players to an undersea cave, where two paths split. The left path leads to an area where players float above pipes generating currents keeping the player floating, where they can also perform a trick on. The right path is a shortcut split with two other paths, one with the current-generating pipes going to a platform with a boost platform and one where it leads to a small cave section with two boost platforms. When the two paths meet, there is a boost ramp where players jump over along with more water bubble pipes, with a big Unagi in front of it. Players can drive over the Unagi's body, where coins appear at the tip of it. If players fall they can just drive under it during the section. After that, players activate the anti-gravity mode and jump off a ramp out of the cave and goes to a platform held with rocks that is tilted almost sideways. There is another ramp on the track after which there is a gliding section. Players fly over a water rapid then land back on the track where there is a few more turns, going back underwater and leading to the finish line. Where the path splits by the entrance of the undersea cave, the right side takes the player to a small cave section with boost platforms and a ramp leading back to the main section of the track. At the end of the course, just before the Start/Finish line, a boost can be used across the off-road section to bypass the final turn of the lap. This is the first (and currently only) Mario Kart course to start underwater. Only about half of the music is played when racing on this course, and the other half plays only when watching a highlight reel. This feature is shared with Super Bell Subway. On the final lap, the music plays only the faster jazz version of the music, unlike all other track music barring Mount Wario and Big Blue where the final lap music is simply a sped up, slightly higher-pitched version of the regular music. On either side of the finish line, Toads wearing scuba diving gear can be seen swimming up and down. This page was last edited on December 23, 2018, at 19:23.